I judge an album by its opening track. When I first listened to ‘Steve Biko (Stir It Up)’ on A Tribe Called Quest’s Midnight Marauders, I knew I was onto something big. It was the first song of theirs I’d heard and now, after years of being a Tribe fan, every time I hear those blaring horns I’m a teenager again, walking to school, feeling like I was at the beginning of something great. He goes on: “in the beginning before the beginning, there were drums, and hymns, and a people carried here from another here, and a language stripped and a new one learned.” Abdurraqib traces back “the paths of rhythm”, aligning A Tribe Called Quest with “the tradition, generally rooted in one-line melodies and call-and-response.” He links the past with the present, like a producer mixing an old sample into a new song. Abdurraqib gives the “art of the sample” the critical attention it deserves. “In the mind of Q-Tip,” sampling is a “science”— it’s “breathing life into someone who doesn’t have life anymore.” I first heard of Tribe years after they’d broken up through modern rappers sampling their songs, and in turn, it was Tribe samples that got me listening to Jazz. Sampling creates a lineage — listening to an album like The Low End Theory, or reading a book like Go Ahead In The Rain, is travelling down a path of rhythm that stretches back decades. Abdurraqib goes back decades into his own life — we see the rise of the band through the eyes of one of their young fans. A lesser writer would dwell on historical facts, writing the lives of the band members with scholarly accuracy. Abdurraqib gives us all the historical context we need — with a knack for anecdote, he covers the birth of Hip Hop, the East-West rivalry, and discusses other musicians from Dr Dre to Leonard Cohen. 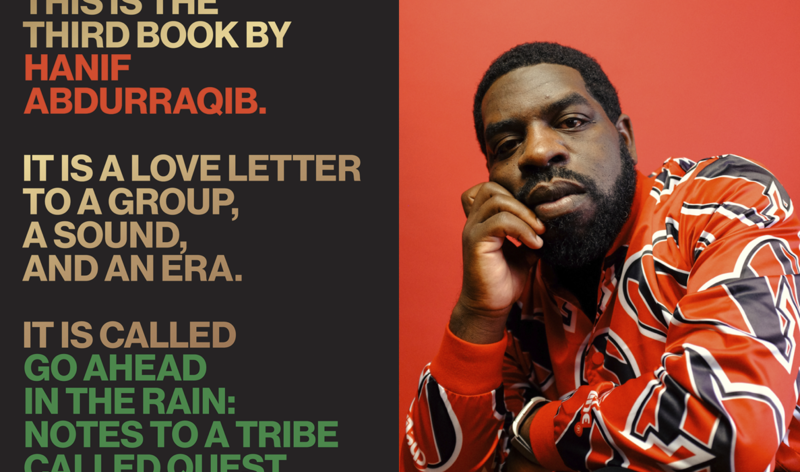 But at all points, the writing remains deeply personal, Abdurraqib finds his own place within Tribe’s story as someone who had their pictures on his wall, someone who would burn their CDs and sell them at school. As the subtitle says, these are “Notes To A Tribe Called Quest” — if Tribe’s music is a call, Go Ahead In The Rain is a fan’s heartfelt response. By exploring the intimate yet distant relationship between a fan and their favourite band, Go Ahead In The Rain is both biography and autobiography. We learn about Tribe, sure, but also their effect on Abdurraqib. And surely the best way to show the power of musicians is to show how their music affects the lives of their fans. This intimacy is most clear in the letters included throughout the book that Abdurraqib addresses to Tip, Phife, Ali, and even Phife’s mother, the poet Cheryl Boyce-Taylor. The letters to Phife are powerful to read. Since he died in 2016, they’re letters that can never be returned, calls that won’t ever meet a response. Phife died at the age of 45 just months before Tribe’s final album, We Got It From Here… Thank You 4 Your Service came out. This book, if nothing else, is a tribute to Phife; an attempt to make sure his talent is known. Abdurraqib sets up the characters of Q-Tip and Phife Dawg as they appear on their records — Tip is the ambitious genius and Phife the unappreciated side-kick. But these stock characters are filled in. While Tip often took centre stage when Tribe was in the public eye, here they both have equal footing. Phife is finally given a sympathetic ear, perhaps (as is clear in the more memoir-like passages) because Abdurraqib seems to relate to him. I’ve often thought that something gets lost in translation when we use one medium to describe another. The best way to describe dance is to dance, the most effective way to pay homage to music is to make more of it, to sample an original, add your song to a lineage. Abdurraqib, in Go Ahead In The Rain, manages to write about music by making his language a type of music. He pays homage to A Tribe Called Quest in the only way fitting, with flow and charm and emotional rawness. When he describes Q-Tip’s “breathless, run-on sentence flow, the words bleeding into each other until the language itself becomes an instrument,” or his “crate digger’s knowledge [and] poet’s ear for language,” Abdurraqib may as well be writing about himself.